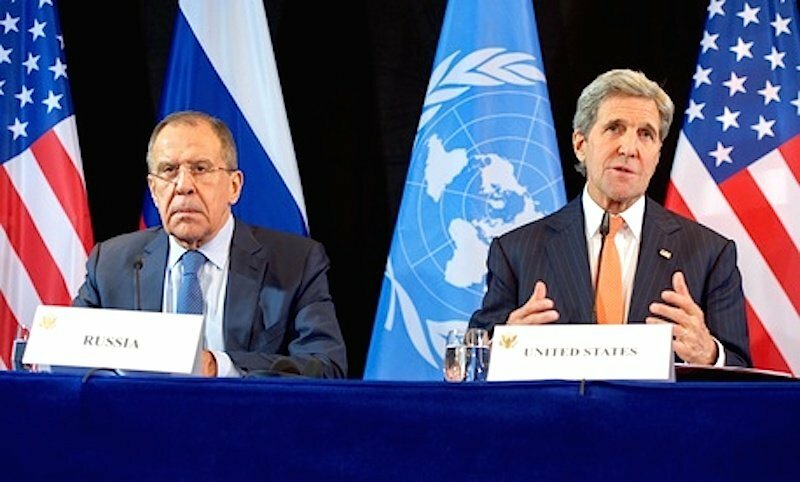 It’s official U.S. policy to protect al-Qaeda in Syria: Will the ceasefire expose it? Judging by the fact that immediately after the CoH agreement was reached top US officials already began announcing that Russia would break the deal while calling for further measures to “inflict real pain on the Russians“, Bhadrakumar’s assessment that a pause, and not a permanent halt, was sought in order to regroup and eventually reverse the tide of war seems to be quite apt. As well there has been an almost ubiquitous media campaign in the US to prime the public for accusations of a Russian infraction, from which a breakdown of the deal would follow; the entire narrative being portrayed is filled with “doubts” and “worries” and “statements from US officials” about how Russia isn’t serious and will likely break the agreement. However, this downgrading from a “ceasefire” to a “cessation of hostilities” actually violates past agreements. Long has there been a tenet of US propaganda which claims that a sort of “third force” of “moderate opposition fighters” exists, separate and distinct from the extremists and al-Qaeda affiliates. Yet when push came to shove the main stumbling-block in the way of the CoH was the opposition’s demand that any truce be “conditional on the al Qaeda-linked Nusra Front no longer being targeted.” Sources close to the talks would tell Reuters that this insistence was the main “elephant in the room” preventing a settlement. Indeed, it was the “moderate” US-backed FSA factions that were some of the biggest advocates of their al-Qaeda partners being included in the truce. Major Ammar al-Wawi, Secretary General of the Free Syrian Army and head of the FSA’s al-Ababil Brigade in Aleppo said that al-Nusra was the FSA’s “partner”, and that al-Qaeda was an ally of most of the groups brought together by Saudi Arabia underneath the Higher Negotiation Committee (HNC) banner. “Nusra has fighters on the ground with rebel brigades in most of Syria and is a partner in the fighting with most of the brigades that attended the Riyadh conference.” And therefore, while the ceasefire is good in principle, it is not good if it does not include al-Nusra, because “if the ceasefire excludes Jabhat a-Nusra, then this means that the killing of civilians will continue since Nusra’s forces are among civilians.” Al-Wawi seems to forget that the reason Nusra is a terrorist organization is specifically because of its indiscriminate attacks and disregard for civilian lives. According to the spokesman for Alwiyat al-Furqan, one of the largest FSA factions operating within the Southern Front umbrella, the FSA “will not accept a truce that excludes Jabhat al-Nusra.”The spokesman later goes on to call Nusra “honorable”, along with the equally honorable Salafi-Jihadists groups Ahrar al-Sham and Jaish al-Islam. Ahrar, it should be noted, only presents itself as being different from al-Qaeda, in actuality it is not, it is a Salafi-Jihadi group which espouses a reactionary and apocalyptic Islamist ideology and has been complicit insectarian mass murders of Alawites throughout Syria. On the other hand, Jaish al-Islam, in the words of their former leader, regards al-Nusra as their “brothers” whom they “praise” and “fight alongside.” Jaish al-Islam as well is infamous for parading caged civilians throughout warzones,using them as human shields. The current leader of the group, Mohammed Alloush, was named as the chief negotiator to represent the rebel opposition in talks with the UN. Comment: From the horse’s mouth: “If you exclude al-Qaeda, you’ll have to exclude all of us! !” Well, yeah, that’s the point. Yet all of this gets recycled within the US media narrative as al-Nusra merely being “intermingledwith moderate rebel groups”, as the Washington Post puts it. While the narrative purports that the FSA consists of “moderate” factions reluctantly forced to endure an al-Qaeda alliance for military expediency, in reality much of FSA conduct throughout the war has not been much different from that of the recognized extremist factions. At times the “moderate” FSA were feared even more by local residents than the other extremist groups. For people paying close attention this is unfortunately not all that surprising. According to a recent poll conducted by ORB, it was found that most Syrians more or less hold both ISIS and the FSA in equal disdain, 9% saying the FSA represents the Syrian peoplewhile 4% saying that ISIS does. Comment: What, don’t Syrians love freedom? That’s true-blue American-style democracy right there! This not-so-popular FSA is routinely described as a separate and distinct entity apart from al-Nusra and ISIS, yet in actuality the lines between the groups have always been extremely porous. “Due to porous links between some Free Syrian Army (FSA) rebels, other Islamist groups like al-Nusra and Ahrar al-Sham, and ISIS, there have been prolific weapons transfers from ‘moderate’ to Islamist militant groups,” writes Nafeez Ahmed, Britain’s leading international security scholar. These links were so extreme that “German journalist Jurgen Todenhofer, who spent 10 days inside the Islamic State, reported last year that ISIS is being “indirectly” armed by the west: “They buy the weapons that we give to the Free Syrian Army, so they get western weapons – they get French weapons… I saw German weapons, I saw American weapons.” Recently the BBC’s Peter Oborne conducted an investigation into claims that the West had embarked upon an alliance with al-Qaeda linked jihadi groups, and came across evidence that the “moderate” FSA were in essence being utilized as a conduit through which Western supplies were funneled to extremists. Oborne spoke to a lawyer who represents Bherlin Gildo, a Swedish national who went to join the rebel ranks in 2012 and was subsequently arrested for terrorist offenses. Based on her client’s own first-hand observations embedded with the rebels, trucks referred to as NATO trucks were observed coming in from Turkey, which would then be unloaded by the FSA and the arms then distributed quite generally without any specificity of the exact recipient. The weapons would be distributed “to whoever was involved in particular battles.” On a similar note, in 2014 US-backed Syrian Revolutionary Front (SRF) commander Jamal Maarouf admitted that his US-handlers had instructed him to send weapons to al-Qaeda, and when they do this, he complies. “If the people who support us tell us to send weapons to another group, we send them. They asked us a month ago to send weapons to [Islamist fighters in] Yabroud so we sent a lot of weapons there,” Maarouf said. Comment: That’s some Through the Looking Glass justice, UK! Career MI6 agent and former British diplomat Alastair Crooke extrapolates further on this phenomenon of the so-called moderate allies of the West playing such a critical role in arming the jihadis. “The West does not actually hand the weapons to al-Qaeda, let alone ISIS, but the system that they have constructed leads precisely to that end. The weapons conduit that the West directly has been giving to groups such as the Syrian Free Army (FSA), have been understood to be a sort of ‘Wal Mart’ from which the more radical groups would be able to take their weapons and pursue the jihad.” This constitutes a sort of ‘supermarket’ where rebels can go and receive weapons, the weapons always migrating “along the line to the more radical elements.” The policy was to “use jihadists to weaken the government in Damascus and to drive it to its knees to the negotiating table,” exactly the same kind of policy used in Afghanistan during the 1980s, when conduits such as the Pakistani ISI were used to funnel weapons to the mujahedeen. Recently a leader of the al-Nusra group appeared in a video expressing the nature of this deep level of cooperation, presenting an FSA member with a gift while saying that there is no difference between the FSA, Ahrar al-Sham, and al-Qaeda. “They are all one,” he explains. The Nusra field commander goes on to thank FSA commanders for supplying Nusra with US-made TOW anti-tank missiles, which were given to the FSA directly, of course, from the CIA. Recently it was reported that several rebel groups, 5 of which belong to the loosely organized FSA, have united under the leadership of the former emir of the al-Qaeda-linked jihadi group Ahrar al-Sham. A longtime al-Qaeda member who sits on al-Nusra’s elite council explained that “The Free Syrian Army groups said they were ready for anything according to the Islamic sharia and that we are delegated to apply the rulings of the sharia on them”, essentially meaning that they had subordinated themselves to al-Qaeda. It has been further revealed that all of the Syrian groups operative in Aleppo had recently declared Ba’yaa (loyalty) to the Ahrar al-Sham emir Abu Jaber. Ba’yaa, it should be noted, means total loyalty and submission, much like what follows from pledging loyalty to ISIS, or any other Islamist jihadist group. However, according to the CIA and the intelligence communities’ own data, this is false. So it should be no wonder why the US tried to push through a provision including al-Nusra in the current ceasefire agreement. 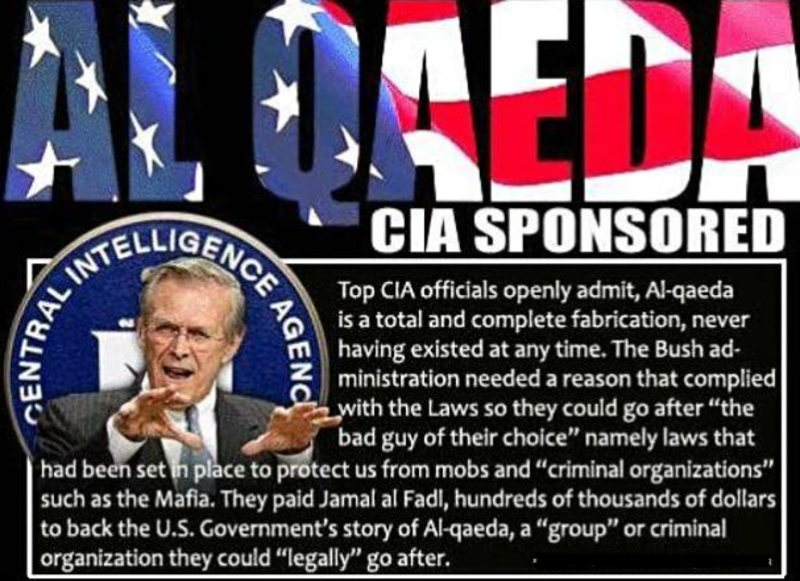 No wonder as well that it has been, and continues to be, official US policy to protect al-Qaeda. For further analysis, see Moon of Alabama, February 20, 2016, “U.S. Ignores Own UNSC Resolution – Tells Russia “Stop Bombing Al-Qaeda!”http://www.moonofalabama.org/2016/02/us-ignores-own-unsc-resolution-tells-russia-stop-bombing-al-qaeda.html. Syria Direct, “Five rebel spokesmen, commanders react to ‘cessation of hostilities’ to take effect Saturday.” February 25, 2016.http://syriadirect.org/news/five-rebel-spokesmen-commanders-react-to-cessation-of-hostilities-to-take-effect-Saturday/#.Vs-kDMO3y9U.twitter. Cockburn, Patrick. “Jihadists Hijack the Syria Uprising.” The Rise of Islamic State: ISIS and the New Sunni Revolution (Brooklyn, NY, 2015), pg. 84-5. Print. Cockburn, Patrick, “The Rise of ISIS”, The Rise of Islamic State: ISIS and the New Sunni Revolution (Brooklyn, NY, 2015), pg. 3. Print. Comment: While the cessation of hostilities in Syria will no doubt be used as the pretext for all kinds of provocations and lies from the U.S. and their allies, it also has the potential to expose their support for terrorists. By the letter of the agreement, they must provide information about participating groups to Russia. Either their moderate rebels will sign on to the ceasefire (in which case, Russia will know when and if they break it), or they will not (in which case, they’ll become justified targets in the Syrian Army’s advances). If few of the so-called moderates sign on, they’ll be exposed as the al-Qaeda stooges they are.